Backers of the proposed Sunnyside Charter Academy are hoping the second time is the charm, as the group earlier this month filed a notice of intent to apply with the Washington State Charter School Commission. #Local charter school proponents, who call themselves Charter Schools of Sunnyside, had their first application turned down in January of this year, chiefly due to financial concerns expressed by the state commission. #The group has taken those issues to heart, which will be reflected in the second application due July 15. #That’s according to Brittany Weaver of Charter Schools of Sunnyside. #One big change in the forthcoming application is a decision to scuttle plans for buying land and building a new charter school building. #“That was one thing that really set us back,” Weaver said of the 2013 proposal to buy land and a building. #By contrast, the second go-round in the application process will see Charter Schools of Sunnyside hope to lease or renovate an existing building. Weaver says the building would likely be in the Sunnyside city limits. #The state commission also recommended the local charter school group have someone on board with strong fundraising experience. #To that end, Weaver says Erin Martin, a vice chair for Charter Schools of Sunnyside, will apply her fundraising expertise on behalf of a charter school here. #Martin, noted Weaver, used marketing strategies to help double the amount raised at the annual Buddy Walk fundraiser for the Down Syndrome Association of the Mid-Columbia, from $40,000 in 2012 to $80,000 in 2013. #Weaver also said Washington state is making start-up grants available for new charter schools. She’s confident Sunnyside can successfully pursue state, federal and/or other grant funds available for charter schools. #“I think we have as good a chance as anyone,” she said. #A total of 12 groups from around the state filed a notice of intent to apply for charter schools. Sunnyside is one of six applying for a second time. #The only other application from Yakima County is the Cesar E. Chavez Charter School of Yakima proposed by the Academy of Continuing Education. #Following the July 15 deadline to submit formal applications, the state commission will hold in-person interviews with the 12 applicants in August. A public forum will be held in September. #The commission will then hold a meeting at YVCC on Oct. 9 and decide which applications to approve. As announced this past February when organizers learned the Washington State Charter School Commission denied an application submitted by Charter Schools of Sunnyside, plans to re-submit an application are still in place. #The commission last week announced it was opening the request for proposals, which must be submitted by July 15. #Letters of intent must be submitted in June. #Charter Schools of Sunnyside has been working to address the issues that prevented approval this past February. #The major sticking point, noted the commission, was the organization’s budget and finances. #“There are a few changes we’ve made to the application,” said Erin Martin, co-chair for Charter Schools of Sunnyside. #Brittany Weaver also chairs the organization. She said the non-profit group has been applying for grants and reached out to other professionals to help improve the budget. #“We’ve also begun a fundraising plan,” said Martin. #The organization has been re-evaluating the amount of money it initially believed was needed for operational costs. In the first round of the application process, the organization stated $1.6 million was needed. #“The new figure hasn’t been decided…it will be less,” said Weaver. #Martin said most of the money Charter Schools of Sunnyside needs to start a school in the fall of 2015 is start-up funding. #“It’s not an obstacle we can’t overcome,” she said. #Weaver said the application process begins in June with public forums to be held this coming September. The commission, she said will make its decision on Oct. 9. #In February the commission noted Charter Schools of Sunnyside needed someone with strong fundraising experience. #Martin said the group has been in contact with different grant writers and fundraising groups to strengthen its financial standing. #“We took the suggestions of the evaluators and the commission, and have worked very hard to address the issues brought to our attention,” said Weaver. It doesn’t seem that long ago when Yakima County’s first attempts at charter schools were dashed (it wasn’t — that was back in late January). So perhaps that’s why I am surprised to see the next round in public school choices coming up. On Tuesday, the Washington State Charter School Commission released the 2014 request for proposals (RFP), signifying the first phase of the six-month process. Prospective applicants, from here on, must submit a notice of intent by June 13, followed by a full proposal due July 15. As some of you may recall, proposals for charter schools in Yakima and Sunnyside were considered for the first wave of schools slated to open in 2014 and 2015. However, neither pitch met the commission’s criteria. Statewide, eight schools were authorized — seven west of the Cascades and one in Spokane. It’s too early to tell how many groups will express interest, said Joshua Halsey, the commission’s executive director. However, he did tell me on Tuesday that officials from local nonprofit Charter Schools of Sunnyside — the group behind the failed Sunnyside bid in the winter — have reached out to him and discussed reapplying. The group had mostly strong marks but its financial model was determined to be weak. Chairwoman Brittany Weaver said in January the group planned to try again and improve those financial flaws. Furthermore, if Sunnyside and any other local groups submit full proposals this summer, they could get the good — or bad — news in person: Halsey said the commissioners will authorize the next group of schools at the Oct. 9 meeting at Yakima Valley Community College. SUNNYSIDE, Wash. -- Board members from the Charter Schools of Sunnyside are already preparing their application to apply for a charter school grant next year. They weren't selected this year because they lacked the financial backing necessary. The Commission was impressed with their academic and organizational plans. With positive feedback from the commission, board members are confident they will be able to secure grant money from different fundraising sources next year. Por Vida Academy wanted to start a school in Yakima. It wasn't selected. The deadline to apply for a Fall 2015 startup is July 15th. YAKIMA – Despite nasty weather, more than a dozen supporters of the Sunnyside Charter Academy showed up at Perry Tech in Yakima last night to speak on behalf of the charter school application. #Among the speakers were local teachers, a Sunnyside school board director and a number of parents. #The public forum is part of the process created by the Washington State Charter School Commission to approve charter schools in the state. The citizens of Washington state voted in 2012 to allow charter schools. #The commission is now considering 19 applications for charter schools, including one from the Sunnyside Charter Academy. The final decision on the applications will be made on Thursday, Jan. 30, in Seattle. #At last night’s public forum the commissioners heard presentations from two groups that want to start charter schools in Yakima County. The forum was the second of nine public forums the commissioners have scheduled across the state. #Sunnyside Charter Academy founders Brittany Weaver and Erin Martin gave an overview of their proposal and introduced several board members during their allotted time. In their 10-minute presentation they explained that their school will use blended learning, a combination of computer learning and teachers, to help students to work at their own pace. #Weaver and Martin said that they have also formed partnerships with other organizations in the community. To help students learn more about agriculture, the charter school has partnered with Heavenly Hill Harvest farm in Sunnyside. The group also mentioned a partnership with Nuestra Casa. #The group already has plans to build a school and during the presentation they said it would serve 504 students at full capacity in grades kindergarten through eight. #The public comments for Sunnyside Charter Academy were uniformly positive. Fourteen people provided feedback to commissioners. #The only speaker who could be said to be neutral was Sunnyside School Board Director Sandra Linde. She stated that the school district is dedicated to helping all students within its boundaries. #Also speaking was Sunnyside High School agriculture teacher Ryan Kannely, who noted that he’s a father first. #Dr. Jared Condie, a Sunnyside orthodontist, spoke in favor of the charter school. He said that many local parents are uncertain how to get involved in their children’s education. He talked about how his fluency in Spanish allowed him to help a neighbor and noted that the charter school’s emphasis on parental involvement will help many local students. #Ethan Weaver, son of one of the founders, talked about his experiences being home-schooled and how working at his own pace had improved his learning. #Hector Gamboa, Sunnyside real estate agent, said the charter school’s emphasis on parental involvement will help not only the students, but the parents. And, as a result, it will also help improve the community as a whole. #Timothy Miller of Yakima supported the Sunnyside group. He noted the efforts of the school to form partnerships. He also spoke of having a learning disability that could have changed his life if his parents hadn’t fought to help him. #The responses to the other group giving a presentation last night were not nearly as positive. Yakima Academy made its pitch first during the meeting. Four of the seven members of the public who spoke expressed concerns. Two addressed charter schools in general while two were concerned with aspects of the Yakima Academy proposal. #The Washington State Charter School Commission will also accept written comments on charter school proposals. Written comments, limited to one page of 12-point font, can be sent to the Washington State Charter School Commission, P.O. Box 40996 Olympia, WA 98504-0996. Commissioners Chris Martin, Dave Quall and Kevin Jacka (L-R) listen to the presentations and public comments last night in Yakima. The commission will be making a final decision on the 19 current charter school applications at its next regular meeting on Thursday, Jan. 30, in Seattle. YAKIMA – A hearing will be held on Wednesday, Jan. 8, in Yakima by the Washington State Charter School Commission to learn more about the proposal from Charter Schools of Sunnyside to open a school in Sunnyside. #“We need as many supporters as possible to come to demonstrate to the commission our community’s desire for a charter school,” said Brittany Weaver of Charter Schools of Sunnyside. #The hearing will be at Perry Technical Institute starting at 6:30 p.m. It will feature a 10-minute presentation by Charter Schools of Sunnyside followed up by up to 30 minutes of public comment. #The forum in Yakima is one of nine being held across the state to hear directly from the 19 organizations that have applied to operate charter schools in the state. The forums are a part of the official evaluation process. #The Washington State Charter School Commission said community members who wish to comment will be limited to two minutes each and will be randomly selected by lottery prior to the meeting. #Written comments, limited to one page of 12-point font, can be sent to the Washington State Charter School Commission, P.O. Box 40996 Olympia, WA 98504-0996. #Charter schools are independent public schools operated by non-profit organizations that are allowed more flexibility with educational programs yet are held accountable for improved student achievement. #Charter schools must adhere to the same state learning standards, accountability goals, health, safety and non-discrimination laws as public schools. Charter schools must hire certificated teachers, must follow generally accepted accounting principles and are subject to state financial audits. Charter schools are also free and open to all students. YAKIMA, Wash. — Backers of charter schools in Yakima and Sunnyside will present their educational visions — and take public comment and questions — at a hearing early next month. Perry Technical Institute will be hosting the public forum Jan. 8 to address proposals by the Yakima Academy and Sunnyside Charter Academy, which could become the first charter schools in the Valley as early as next year, the Washington State Charter School Commission said Thursday. San Antonio, Texas-based Por Vida Inc., the nonprofit behind Yakima Academy, will be presenting at 5:30 p.m. that day. The group Charter Schools of Sunnyside, meanwhile, will present approximately one hour later. According to the charter school commission, each applicant will be given 10 minutes for a presentation, followed by 30 minutes of public comment. Each individual wishing to speak will be limited to two minutes. Written statements can also be sent to the commission or delivered personally at the January hearing. Brittany Weaver of Charter Schools of Sunnyside said school supporters have been doing similar presentations to the public since September and should be comfortable with a public forum. They want to set up a school in Sunnyside for the 2015-16 school year. Joseph Rendon, the Por Vida superintendent, said he plans to meet with his school board Monday and finalize details on who will make the trek from San Antonio to Yakima and what will be addressed. Por Vida, which would open the Yakima school next school year, has three high schools in south Texas. The forums are part of the commission’s evaluation process to decide which applicants will be granted their request to set up a charter school. Under state law, up to eight of these publicly funded, independently operated schools may be initiated in each of the first five years. Charter schools will be free and open to all students. There will be nine public forums across the state next month, starting Jan. 6 in Spokane and ending Jan. 23 in Tacoma. The state commission has said it will make its decision on the applicants by Feb. 24. Succeeding on one-of-six tries doesn’t make for a good batting average or apparently a convincing case that Washington’s charter school law is unconstitutional. #That was the result yesterday, Thursday, when King County Superior Court Judge Jean Rietschel ruled in a legal challenge to the state’s voter-approved charter school law. #The case was brought against Washington state by plaintiffs that included school administrators, educators and the League of Women Voters. They raised six questions opposing the legality of the charter school law backed by voters in 2012. #In her ruling yesterday, Rietschel essentially upheld the law, finding that only one limited aspect of the law should be stricken. #She found it unconstitutional to designate a charter school as a “common school.” Under her ruling, charter schools could be ineligible for certain limited funding sources reserved exclusively for common schools. #In other words, charter schools won’t have access to state matching funds to construct school buildings. #And that suits supporters of the charter school movement just fine. #A local group that applied for a kindergarten through eighth grade charter school in Sunnyside is thrilled with the ruling. #If Sunnyside is granted a charter school – it is one of 22 applications the state is considering – Weaver says the plan is for a mix of grant and private funds to hopefully construct a school building in the area of the former Monson feedlot. #“Start-up costs are funds we already expected to raise,” Weaver said. #Appeals on yesterday’s decision are likely. #But with a ruling upholding most of the law, the Washington State Charter Schools Association is pressing forward with establishing the schools. #The idea of progressing forward with charter schools was also noted by Washington state Attorney General Bob Ferguson. #“As attorney general, it is my job to defend the will of the voters,” Ferguson said. #“The court has held the vast majority of the charter schools initiative constitutional, and the state will continue to implement this law,” Ferguson added. #Macfarlane said the 22 charter school applications are under review now, with up to eight of them getting the green light likely by the end of January 2014. #Whether or not Sunnyside’s charter school application is approved, Weaver says the experience has been worthwhile. YAKIMA, Wash. — And then there were two. Proposals in Yakima and Sunnyside are two of 22 submitted by nonprofit groups intent on launching charter schools in Washington — possibly in the Valley — starting next school year. These groups will know which eight grabbed the coveted first slots no later than Feb. 24. Interested nonprofits that had submitted letters of interest to the state’s charter school commission in October had until 5 p.m. last Friday to send in final documentation, which included proposed budgets, possible locations and curriculum. The proposal for a school in Yakima comes from the Texas nonprofit Por Vida Inc. The San Antonio-based group wants to launch a high school for at-risk students such as drug addicts, gang members, high school dropouts and migrant students. Por Vida, which translates from Spanish to “For Life,” already has three charters in south Texas but wants to expand elsewhere. Superintendent Joseph Rendon recently said a conversation with a Sunnyside resident at a conference a year ago prompted him to seriously consider the Valley. The other nonprofit in the Valley still in the running is Charter Schools of Sunnyside. The group wants to implement a system based on intense parental involvement and a rotation-based form of student learning. According to one of the cofounders, interest is high among Sunnyside residents. The charter school commission, a nine-member panel in charge of managing and overseeing the new school system, will begin evaluating the proposals in early December, but this week the members must check that all applications are complete. After that, a group of charter school experts will be brought in to evaluate the proposals. These experts, said Sundquist, will eventually interview each applicant and determine whether it merits a recommendation. Sundquist said he has been “very pleased” with what he has seen in the proposals and the “wide mix” of teaching options presented. “It’s pretty clear that we have a number of different approaches here,” he said. Public forums in regions where proposed charter schools would be situated will be held in January. Sundquist speculated Yakima would most likely be the site for one of these gatherings. State voters approved a measure last November to allow charter schools, the 42nd state in the country to do so. Under the new measure, up to eight charter institutions can be established annually for the first five years the law is in place. A charter school is publicly funded like a public school and free for students. However, they are run independently from school districts and free to follow their own curriculum. Local charter school supporter Brittany Weaver is making the rounds seeking support for the establishment of a Sunnyside charter school. 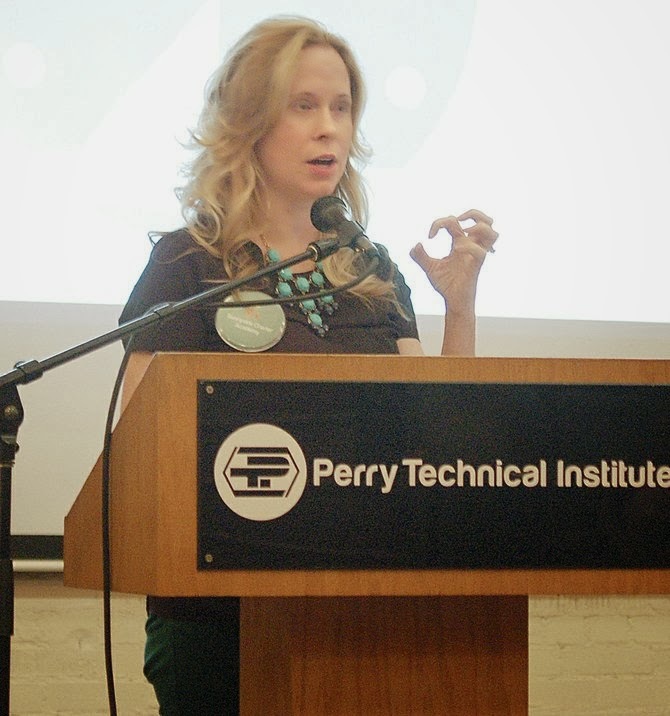 This past Wednesday she spoke at the Sunnyside Daybreak Rotary meeting explaining the application process. Photo by Julia Hart. A local group of charter school organizers is in the process of collecting signatures to include with their application to establish a charter school in the Sunnyside School District. #The signatures would be a welcome show of support for the new school, according to Sunnyside Charter School Committee spokesperson Brittany Weaver. #She said the deadline for the group to submit its letter of application to the Washington State Charter School Commission is Nov. 22. 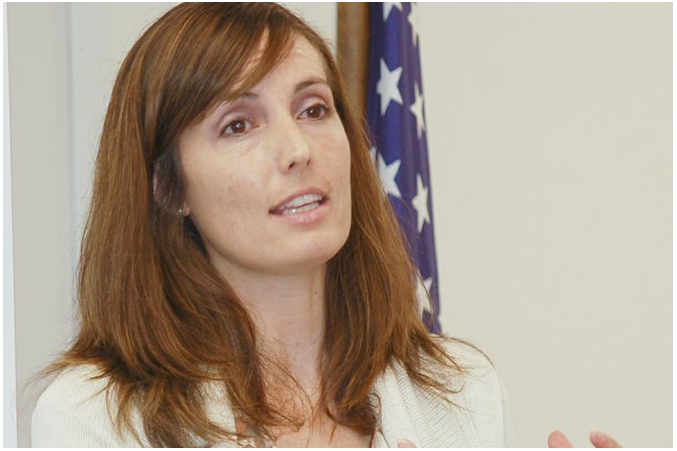 #If the state accepts the local application, Sunnyside parents could have the charter school option available to them as early as the 2015 school year, Weaver told Sunnyside Daybreak Rotarians at their regular weekly meeting this past Wednesday. #Weaver said the local charter school committee submitted a letter of intent to establish a charter school in Sunnyside in October as part of the application process. #“We believe the establishment of the charter school in our community will give Sunnyside parents one more option for educating their children,” she said. #Weaver said the local group is in the process of forming a board of directors which will reflect the diversity of the community. Weaver, who currently home schools her younger children, said the intent is for the Sunnyside charter school to be a K-8 facility. #“We are working closely with the Sunnyside High School administration to ensure the charter school students’ curriculum lines up with high school graduation criteria,” she said. #She said charter school students will be able to work at their own pace and parents will be expected to be much more involved with their children’s education. #Washington is the 42nd state in the nation to approve the establishment of charter schools, which will be funded by state and federal dollars, Weaver said. #There are currently 2 million students attending charter schools across the country, she added. #Weaver said Washington state will only be approving eight charter school applications each year for the next four years. #“We hope to be one of those first eight schools,” she said. #She encouraged charter school supporters to contact her to sign the charter school petition by emailing her at sunnysidecharterschool@gmail.com. Sunnyside residents Brittany Weaver and Erin Martin presented a slideshow about charter schools to the Sunnyside City Council Monday night. #The two are representatives of Charter Schools of Sunnyside, an organization that hopes to open the Sunnyside Charter Academy in the fall of 2015 to serve at-risk students. #In strictly an informational presentation, as city council approval is not needed, Weaver and Martin said charter schools are free public schools open to all students but governed by a non-profit organization instead of a school board. Charter schools are funded like public schools, based on attendance, through public taxes. #Charter Schools of Sunnyside has until Friday, Nov. 22, to submit an application to the state charter school commission to run a charter school in Sunnyside. The organization has already filed a letter of intent. #The plans for the charter school include using a blended learning program with a heavy emphasis on parent involvement to create a K-8 program in the city. #If the program is approved, it will start as a K-5 school in 2015 and add a grade each year until it is a K-8 program. Students graduating from the academy would likely attend Sunnyside High School. #Weaver said the goal is to make strong connections with the local school district while offering a different type of program for students with special needs. #Councilman Dean Broersma asked where the classes would be held. Weaver explained that the organization is looking at several sites. The school would most likely use modular offices for the first few years. #Mayor Jim Restucci asked who controls the charter school curriculum. Weaver said the school will function independently from the Sunnyside School District and the principal and teachers will make decisions on the curriculum. #Restucci also asked if the school would fall under the auspices of the Office of the Superintendent of Public Instruction. Weaver said the charter school would be getting funding through OSPI and must show its progress to OSPI to continue getting funding. #Weaver also noted that if more students want to attend the charter school than there are available seats, a public lottery will be held to determine which students get into the school. 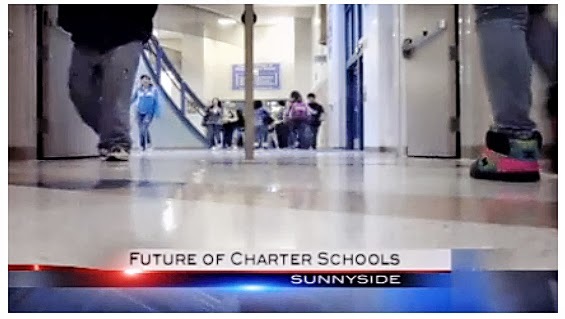 The nonprofit organization Charter Schools of Sunnyside will be hosting an open house today to discuss its proposal for a charter school in the city. The open house will begin at 6 p.m. in the South Hill Park Pavilion, 1521 S. First St. in Sunnyside. Charter Schools of Sunnyside expects to submit a proposal for a charter school with the Washington Charter School Commission. As of now, only the commission and Spokane Public Schools can approve a group’s proposal. Interested nonprofits must submit applications to an approved authorizer by Nov. 22. SUNNYSIDE, Wash.--Two moms in Sunnyside are striving to bring more educational opportunities to their community. Brittany Weaver and Erin Martin started a non-profit called "Charter Schools of Sunnyside." Friday night, they're holding a meeting at the Sunnyside Community Center to try and establish a board of directors. The founders say they believe charter schools will help Sunnyside students succeed and get parents involved. "If they don't know how to help, if they don't know how to do homework, if they don't know what they can do to help their children succeed, this school wants to bring those parents in to help to teach them as well," said Weaver. The founders said once their board is in place and plans are finalized, they'll take their case to the Washington State Charter School Commission for approval. 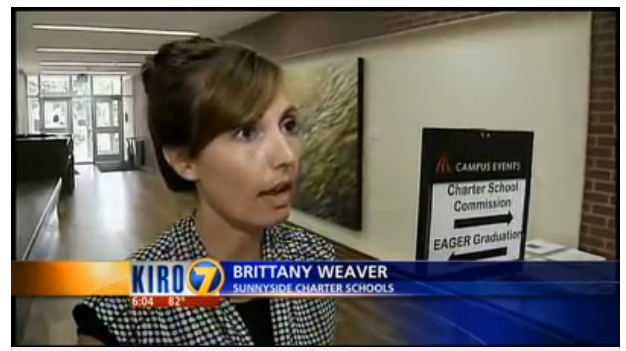 We (Brittany Weaver and Erin Martin) made a trip to Everett, WA to attend a Charter School Commission Board meeting. The purpose was to get the name of "Charter Schools of Sunnyside" out there and to show the commission how serious we are about getting a Charter approved in Sunnyside. We also had some great networking opportunities and made some friends along the way. Overall it was a great experience and we learned a lot. Brittany was interviewed by KIRO 7 TV. Below is the transcript of the news segment with Brittany speaking. Essex Porter: The Charter School commission meeting is still underway here at Everett Community College. Some parents are attracted to charter schools because they are free from Union Rules and some of the school district regulations that some parents believe hamper education. However the state still places many requirements on Charter schools. Only the Spokane School district got the daunting paperwork in on time, so the first charter schools in Washington will likely be created by parents. And it was parents we met as the Charter Commission adopted some rules. Berta Garza is planning a spanish english school named after civil rights icon, Ceaser Chavez. Berta Garza: A dual language charter school in the Yakima area so we can get the at risk students who are being left behind. Jodie Kotrlik from Vancouver: Really accessing those kids who are not finding the public school system successful for them. Brittany Weaver from Charter Schools of Sunnyside: I'm a strong believer in the free market and if we are raising the standard of excellence, and raising the bar, then I hope our school districts will rise as well. Essex Porter: The rules are extensive. So are you over worried about burdening the charter operators? Steve Sundquist from the Charter Commission: Well I think this is an area where you expect any school to still have to meet basic health and safety requirements for kids. Clearly they have to be financially solvent..
Essex Porter: These prospective charter operators came away with a better idea of what they're getting into. Have you seen anything here that tells you, "Well, maybe it's too much"? Jodie Kotrlik: No, No! We're not going to be scared away by it being too much, we are a very passionate group of people. We're going to bring it! Essex Porter: Now only 8 charter schools across the state will be approved to open next fall. And this is going to be quite a sprint for the parents. The applications are due in November.